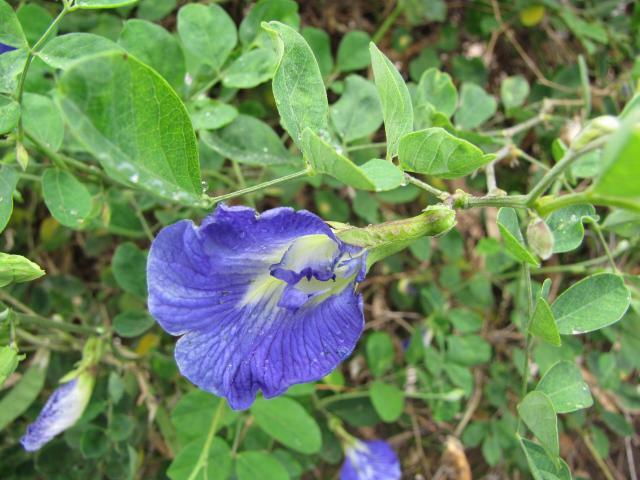 The butterfly pea (Clitoria ternatea L.) is a vigorous, trailing, scrambling or climbing tropical legume. Its sparsely pubescent stems are sub-erect and woody at the base and may be up to 5 m long. They root only at the tips (Cook et al., 2005; Staples, 1992). The leaves are pinnate, bearing 5-7 elliptical, 3-5 cm long leaflets. The flowers are solitary or paired, deep blue or pure white, about 4 cm broad. The fruits are flat, linear, sparsely pubescent pods that dehisce violently at maturity and throw 8-10 dark and shiny seeds (FAO, 2012; Cook et al., 2005; Staples, 1992). There are numerous ecotypes, agro-types and cultivars that differ in flowers and leaflets (FAO, 2012; Staples, 1992). Many cultivars have been bred in Latin America, notably in Cuba and Mexico (Cook et al., 2005; Villanueva Avalos et al., 2004; Gomez et al., 2003). Clitoria ternatea is a high-quality, protein-rich legume, a "tropical alfalfa" often referred to as a protein bank that can be grown at low cost (Cook et al., 2005). Livestock tend to prefer it over other legumes and grasses and it is therefore much valued as a pasture legume. It is also used for cut-and-carry feeding systems and cut for hay and silage (Gomez et al., 2003). An N-fixing legume, Clitoria ternatea is used as a ley legume or as green manure. It is a valuable cover crop in rubber and coconut plantations. The young pods are edible and used as vegetables in the Philippines (Staples, 1992). 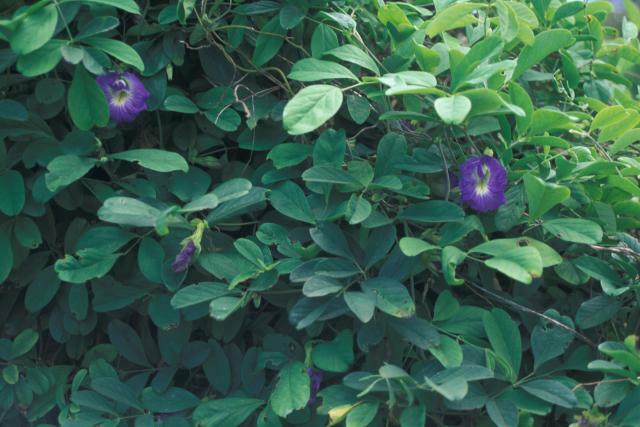 Butterfly pea is used in fences and in trellises as an ornamental for its showy flowers, valuable for dyeing and in ethno-medicine (Cook et al., 2005). All parts of Clitoria ternatea contain peptides called cliotides that have potent anti-microbial properties against Escherichia coli (Nguyen Giang Kien Truc et al., 2011). Clitoria ternatea may have originated from Latin America or Asia but is now naturalized in all the semi-arid and sub-humid tropics of Asia, Africa and Australia (Staples, 1992). A fast summer-growing legume, it can cover the soil within no more than 30-40 days after sowing and yield mature pods within 110 to 150 days. It is naturally found in grassland, open woodland, bush, riverine vegetation, and disturbed places. Clitoria ternatea grows within 20°N and 24°S, from sea level up to an altitude of 1600-1800 m, and in equatorial Africa up to 2000 m (FAO, 2012; Ecocrop, 2012; Cook et al., 2005; Staples, 1992). Butterfly pea does better where average temperature is about 19-28°C and where annual rainfall ranges from 700 to 1500 mm. However, it tolerates temperatures as low as 15°C and even some frost as it may regrow from the stems or from the plant base, provided it is already woody when the frosting occurs. It does well under irrigation but has only a low tolerance of flooding or waterlogging. It has also some drought tolerance and can grow in places where rainfall is as low as 400-500 mm. It can survive a 5-6 month drought in the drier tropics. Clitoria ternatea can grow on a wide range of soils but is particularly adapted to shallow, heavy clay and sodic soils (pH 5.5-8.9). It thrives in full sunlight but can also grow under light shade in rubber and coconut plantations (FAO, 2012; Ecocrop, 2012; Cook et al., 2005; Staples, 1992). Clitoria ternatea can be sown in pure stands (generally as a short-term rotation with crops) or in association with tall and tussock grasses for permanent pasture. When sown for pasture, it does well with elephant grass (Pennisetum purpureum), forage sorghums (Sorghum bicolor), millet species, Guinea grass (Megathyrsus maximus), pangola grass (Digitaria eriantha), gamba grass (Andropogon gayanus) or Dichanthium aristatum. When it is over-sown in permanent pasture or sown in mixture with fast growing grasses, its establishment may be more difficult (Cook et al., 2005, Staples, 1992). In places where it is intended for revegetation, it can be sown with buffel grass (Cenchrus ciliaris) and Rhodes grass (Chloris gayana) (Cook et al., 2005). In Australia, Clitoria ternatea is particularly valuable as protein-rich forage in very heavy and shallow soils where leucaena (Leucaena leucocephala) cannot grow (Cook et al., 2005). Compared to leucaena, it has a shorter time to first grazing, lower establishment costs, and is much easier to remove, being an herbaceous legume (Conway et al., 2001). Once established, Clitoria ternatea quickly covers the soil and can be directly harvested by grazing or as cut-and-carry forage. It should not be cut too low and too often. It is sensitive to trampling that may hamper regrowth from the tips and cattle should not enter the stand more than 2-3 hours/day. Only light grazing should be allowed during the establishment year so that the plants can set seed for stand regeneration and develop a strong frame that can withstand grazing. Heavy grazing is then possible provided it is done rotationally (Cook et al., 2005). Forage DM may range from 0.2 to 16 t/ha/year depending on growing conditions. In dry Australian conditions, the cultivar Milgarra yielded 2 to 6 t DM/ha/year. Under irrigation, yields up to 30 t DM/ha could be achieved (Cook et al., 2005; Bustamante Guerrero et al., 2002; Staples, 1992). Clitoria ternatea is an N-fixing legume and can be used as a ley legume and as green manure. It is also useful in revegetation of coal mining sites in central Queensland (Australia) (FAO, 2012; Cook et al., 2005). Clitoria ternatea is a forage of a consistently high nutritional value. Its crude protein content is comparable to that of alfalfa with values for the fresh forage typically higher than 18% DM. Forage quality persists even when maturity is advanced, without affecting digestibility or feed intake (Barro et al., 1983). For instance, protein content in Clitoria ternatea hay varied from 23% DM in the vegetative state (42 days regrowth) to 19% DM at seeding (82 days). During the same period, ADF increased from 38 to 47% DM. The lignin content appears to be quite high, usually about 10% DM and higher than 15% DM in some cases. Unlike other legumes, Clitoria ternatea seems to be relatively free of toxic compounds and can be fed to ruminants and monogastric species (Cordoba et al., 1993), though its relatively high fibre content may be limiting for pigs and poultry. It is also very palatable (Cook et al., 2005). Clitoria ternatea seeds are protein-rich (about 38-43% DM) (Bravo, 1971b; Odeyinka et al., 2004; Schlink et al., 1993). However, little is known about their actual nutritional value and their high condensed tannins content and other antinutritional factors may make them unsuitable for animal feeding (Bravo, 1971a; Villanueva Avalos et al., 2004). Neither bloat nor toxicity have been reported (Cook et al., 2005; Villanueva Avalos et al., 2004). The seeds are a strong purgative (Cook et al., 2005). They contain condensed tannins and trypsin inhibitors (Bravo, 1971b; Macedo et al., 1992). Clitoria ternatea is a good protein-rich forage that is used either alone or as a protein supplement for grazing animals. Productive behavior of animals fed with Clitoria ternatea is quite acceptable and compares favourably to that obtained with other high quality supplements and forages, and it often contributes significantly to lower production costs (Villanueva Avalos et al., 2004). Clitoria ternatea forage is palatable to sheep, goats and cattle (Chakravarty, 1970) and no toxicity has been observed (Hall, 1985). There are few digestibility measurements available in the literature: in vivo OM and DM digestibility values for the hay range from 50-60% (Ratan et al., 1982; Upadhyaya et al., 1983) to 72-74% (Medrano, 2001; Bustamante Guerrero et al., 2002), which reflects probably the high fibre content of the forage. Numerous studies have shown that it is possible to substitute grains, by-products and alfalfa hay with Clitoria ternatea hay in a supplementary feed for dairy cows at different stages of lactation, without a visible downturn in milk production, and at the same time reducing feed costs (Villanueva Avalos et al., 2004). The following table presents various situations where supplementation with Clitoria ternatea hay or the use of mixed grass-Clitoria pasture was beneficial to dairy performance or to dairy income. The following table presents various situations where supplementation with Clitoria ternatea hay or the use of Clitoria pasture (alone or in association) was beneficial to growth performance. While Clitoria ternatea has been described as suitable for pig feeding (Cordoba et al., 1993), little information exists concerning its utilization for pigs. Clitoria ternatea stands grazed by pigs had a higher acceptability (620 g DM/100 kg W) than stands of the tropical legumes siratro (Macroptilium atropurpureum) and centro (Centrosema pubescens) (Mora et al., 2005). Clitoria ternatea silage was found to be relatively digestible (OM digestibility 66%) and to have a metabolizable energy value (10.3 MJ/kg DM) higher than that of dehydrated alfalfa (López et al., 2001a). Dried leaves of Clitoria ternatea have been tested with success as a feed diluent for broilers (Marin et al., 2003). However, broiler performance was decreased when it was used as a feed ingredient as a substitute for maize (Monforte et al., 2002). 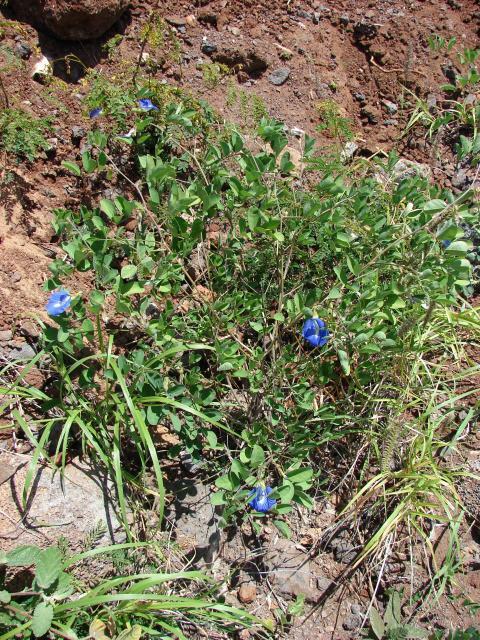 Clitoria ternatea is a common forage for feeding rabbits in Mozambique and Sudan (Muir et al., 1996; Elamin et al., 2011). When fed ad libitum with fresh Napier grass (Pennisetum purpureum), Clitoria forage could not support rabbit growth. However, when fed ad libitum with green sweet potato vines, Clitoria forage gave a growth rate representing 75% of that observed with growing rabbits receiving the pelleted control diet (Muir et al., 1991). When given to rabbits in addition to a pelleted diet, the voluntary forage:concentrate ratio was 17%:83 % on a DM basis and the growth rate 93% that of rabbits fed pellets only (Muir et al., 1991). When fed ad libitum to breeding does together with other forages and wheat bran, fresh Clitoria ternatea supported better reproduction performance than fresh leucaena (24%) and wheat bran (76%) (Muir et al., 1995). When included at 15% in a growing rabbit complete diet, dried Clitoria terneata allowed a growth rate similar to that observed with the inclusion of 12% dried berseem or 15% sweet potato vine (Elamin et al., 2011). According to these results, Clitoria ternatea can be considered as suitable forage for rabbit feeding, mainly as a fibre source but also as a source of protein. Its high level of lignin could be considered as an advantage for controlling the digestive health of rabbits (Gidenne et al., 2010). McDowell, L. R. ; Conrad, J. E. ; Thomas, J. E. ; Harris, L. E., 1974. Latin American Tables of Feed Composition. University of Florida, 552 p.
Villanueva Avalos, J. F. ; Bonilla Cardenas, J. A. ; Bustamante Guerrero, J. de J., 1996. Productive response of brown swiss cows supplemented with crescent levels of Clitoria ternatea L.. Reunion Nacional de Investigacion Pecuaria, Cuernavaca, Morelos, (Mexico), 2-4 Dic 1996.